Social media platforms continue to provide innovative ways for consumers to visually interact with brands and publishers, reimagining the way people shop online. 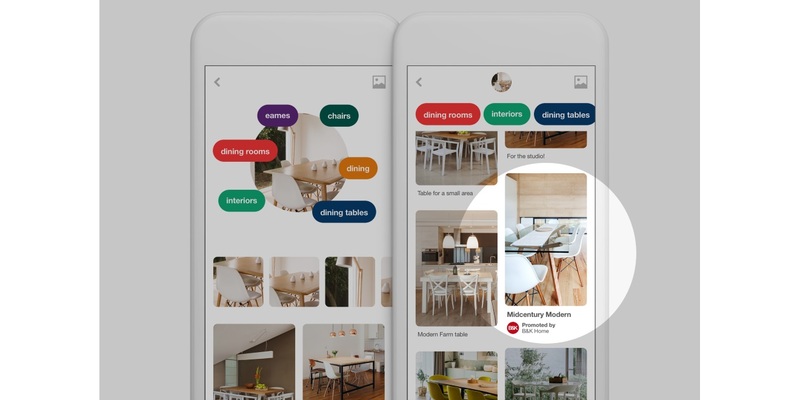 In a move to further serve users’ unique shopping habits, Pinterest recently introduced three new visual discovery tools to help people find more ideas and products—Lens, Instant Ideas and Shop the Look. Lens offers users the ability to search for ideas using their mobile cameras by taking a photo of something, after which they see recommendations for similar objects. Instant Ideas enables users who see a concept they like in a Pin to tap the circle in the bottom-right corner for similar ideas and real-time recommendations relevant to their interests. And Shop the Look enables users to browse and buy products seen inside Pins directly on Pinterest. Pinterest’s rollout of these new search tools helps improve the user experience, making it a more popular destination for purchases and thereby playing an increasingly important role in the marketing mix for advertisers. There’s never been a better time to capitalize on the opportunities of this emerging platform, so how can marketers make the most of these new Pinterest visual discovery tools and avoid any potential pitfalls? Nearly any e-commerce advertiser can take advantage of Pinterest’s new visual features. Many advertisers have contracts with manufacturers and brands to promote their products, and these tools enable them to apply the same approach they do in magazines while tagging individual products from retailers in a digital manner. By using a cost-per-engagement model, advertisers can get in front of new audiences. Marketers shouldn’t be intimidated if they’re unfamiliar with the Pinterest platform; instead, they should recognize the decision and buying power of the hyper-engaged “pinner” and reap the advantage of early adoption of these new visual discovery tools by getting involved through Pinterest agency partners to try them out. Since Pinterest is a mix of social, search and display, marketers can integrate multiple targeting methods and get in front of their audiences while they’re still in the planning process, essentially marrying the intent of search with the scale of social. As micro-targeting and catalog shopping experiences become more pertinent on all channels, having a strong product feed and multiproduct lifestyle shots for e-commerce clients are key. Feed-based media buys are replacing lower-funnel targeting and, with these new tools, Pinterest provides greater scale by enabling marketers to publish all products using Pins to make their entire catalog shoppable. This feature reaches a new level with Shop the Look, where users who are ready to buy can check out right on Pinterest. Targeting through Pinterest can be based on a remarketing pixel, searched keywords, interests, customer match list, demographics or location. Additionally, Pinterest offers a similar audience list based on owned lists, via email or remarketing, and creates a totally new audience of users to prospect. It’s important to keep in mind that this similar audience list is based off actual Pinner behavior and generates an audience of Pinners who act similarly on the Pinterest platform. Marketers shouldn’t limit targeting to remarketing, as it won’t reach an untapped audience. As with any marketing effort, it’s important not to set it and forget it—marketers need to adjust bids, budgets and targeting based on results, including using engaged audience insights to scale targeting and place the Pinterest pixel for attribution purposes. Regardless of the type of marketer, it’s imperative to create ads unique to Pinterest utilizing best practices. Marketers should be careful not to fall into the mindset of reusing ill-fitting creative just to get ads live sooner. Instead, consistently test creative by audience and ad type when leveraging these new discovery tools, using clear calls to action and overlays in the creative.